High-quality lighting serves no purpose if it is switched on only for a few hours a day; by contrast, there is no sense in providing illumination for 15 hours a day if the lighting is inappropriate. One will not compensate the other under any circumstances. Once the lighting is suitable, both qualitatively and quantitatively, you must decide for how long you are going to switch it on. Some, generally small, aquariums, include basic equipment. The lighting is therefore incorporated into a hood which cannot get splashed by the water.. In tropical regions, the day lasts for approximately 11 to 13 hours, and this is what wild plants and fish are accustomed to. The situation is different for plants and animals raised in captivity, which can tolerate different lighting, but always within the bounds of reason. 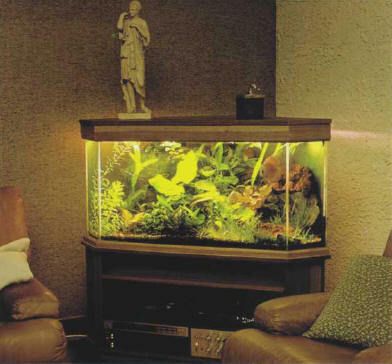 An aquarium can be lit for 13 hours a day, but some hobbyists exceed these limits, as they get used to turning the aquarium on when they get up and switching it off late at night. In this way the lighting can be on for stretches of 16 or 17 hours, which is far too much. It does not especially harm the fish, but it nevertheless changes the balance of the aquarium, and is particularly conducive to the development of algae. It is advisable to keep the lighting on for about 10 hours and switch it off at around 10 or 11 o'clock at night. 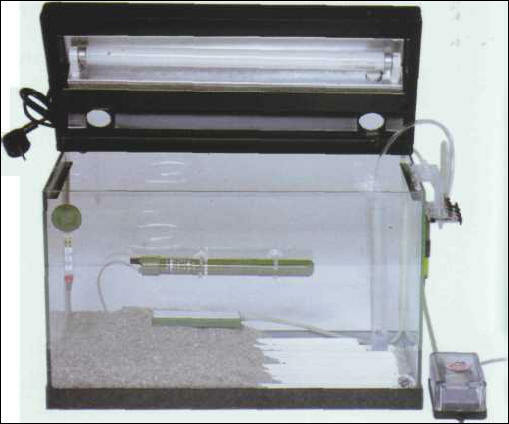 The use of programmed electrical clocks facilitates this operation, and particularly avoids any abrupt and unnatural transition from dark to light, which can be harmful to some fish in the aquarium. In this way, the aquarium will receive the light of the new day first, followed by its own lighting. Once the artificial lighting has been switched off at night, the tank will still be able to take advantage of the ambient lighting. 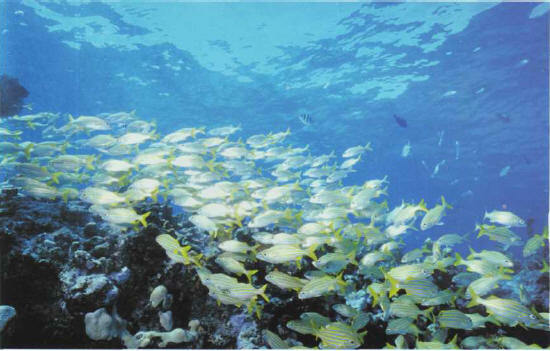 A blue tube can be added to daylight lamps to recreate the lighting in reef areas. It is also possible to create a program that switches the fluorescent tubes on and off, one after the other, using several timers, thereby recreating, to a certain extent, sunrise and sunset. The ideal lighting program would therefore switch on the room's ambient lighting in the morning, or allow the dawn light to exert its influence, then turn on one tube about 1 hour later, and finally switch on the other tubes a little later. At night, it would first turn off some of the tubes - with just one remaining lit - then, a short while later, the final tube. and. finally, the ambient lighting in the room. Last but not least: do not interrupt a daytime light. Several hours of darkness, whether total or partial, unbalances the growth of plants and the behavior of fish. The fluorescent tubes must be distributed with, optimally, a distance of 8-10 cm between them (diagram 1). In the fitted aquariums that are commercially available, the length of the tubes matches that of the aquarium, although it is noticeable that the sides of the aquarium receive a little less light than the center or the front and back. Problems arise when the tubes are markedly shorter than the tank, which can occur in commercial aquariums with unusual dimensions, or in homemade ones. If the tubes are all centered, then there is a space on both sides, which may disadvantage plants on the sides of the tank. A partial solution to this problem is alternating the position of the tubes along the sides (diagram 2). Another option is the use of tubes of different lengths, making sure that they are arranged to cover the whole surface of the tank and that their total intensity is sufficient. How many fluorescent tubes are needed for good illumination? Good lighting must both cover the needs of plants and satisfy the visual sense of onlookers. Happy ending massage nyc new york brooklyn manhattan happy ending massage manhattan.